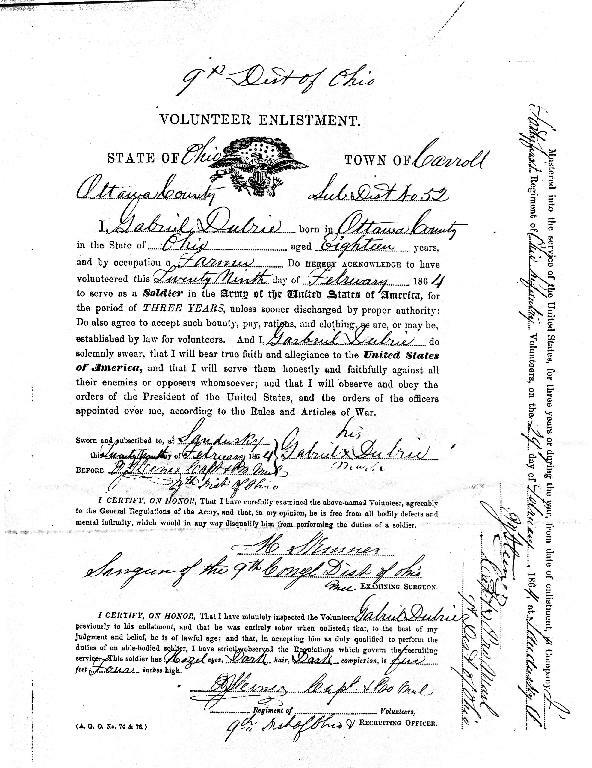 Eighteen year old Gabriel Dubrie enlisted with Company I, 41st Ohio Volunteer Infantry, on Feb. 29, 1864. He was recruited while the unit was on it's veteran's furlough in Ohio, along with around 100 other men. He served a little more than a year with the regiment, and would have seen the march to Atlanta, the battle of Nashville, and the 1865 occupation duties in the west, not to mention the accident with the Oneida. It's interesting to note that his name is mispelled in the company rosters (it appears as Gabriel Dubsey in the regimental history by Kimberly and Holloway). Below is a copy of his enlistment papers - a little worn with time and a bit fuzzy from the process of being digitized, but still interesting. Our thanks to Gabriel's descendant, Lewis Holland, for providing the image.